It’s Derby Week! And, as usual, the Cooper Family is gearing up for another live draft. Welp. Another favorite ended up wearing the roses again in 2017. One could argue that Always Dreaming wasn’t the obvious favorite last year – he didn’t even open with the best odds on race day (Classic Empire was 4-1, while McCraken and Always Dreaming were co-second favorite at 5-1), but by the time betting closed, Always Dreaming had dropped to 9/2, which was ultimately the best. Truth is, if I’d had the top pick last year, I would’ve looked elsewhere, just like both Karlie and Mom did in 2015 when they let American Pharoah fall to me with the 3rd pick. So sure, the favorite keeps winning, but there’s no telling who the true favorite even is sometimes, and there’s no guarantee the person picking 1st will even take the horse with the best odds. To quote Ned Ryerson: It’s all one big crapshoot anyhoo. Quinten did take Always Dreaming first overall, and the horse did break well beating everyone inside him to the rail and that’s all she wrote. Well done, Q.
I finished surprisingly well with long shot closer Lookin at Lee finishing 2nd. I added him with my final pick at #18 and got lucky. Dad made the mistake of selecting the #17 horse, Irish War Cry, who finished 10th, which earned Dad the top pick in this year’s draft. We do this every year, and these annual posts are mostly for my own documentation at this point. Maybe some of you enjoy them. Who knows. Ok let’s look at this year’s group. Yes, the favorite keeps winning, but this year looks dicier. This year we get to talk about a CURSE!! Every horse in the Kentucky Derby is a 3-year old. It’s a requirement for the race. This means each racehorse has only run handful of competitive races up to this point. Most began racing as 2-year olds, but occasionally there’s a horse or two who arrived late to the track and never ran before turning 3. In 1882, a horse named Apollo won the Kentucky Derby after only running as a 3-year old. Since then, 61 horses have tried to do the same not a single one of them has won. In 136 years…not a single one. There have honestly been just a few who even came close. Of those 61 horses, just 3 finished 2nd (most recently – Bodemeister, 2012) and only 1 finished 3rd (Curlin, 2007), and the rest didn’t even make the podium. So, the Curse of Apollo…is it real? Do you believe in curses? Because it’s about to be seriously tested as two of the top contenders never raced as a 2-year old: Justify (opened as the favorite at 3-1) and Magnum Moon (third favorite at 6-1). Justify is 3 for 3 in prep races though, most notably a wire-to-wire win in the Santa Anita Derby. Likewise, Magnum Moon is 2 for 2 including a win at the Arkansas Derby. Other top options include Mendelssohn (5-1) who dominated the UAE Derby by like 19 lengths (!!! ), Bolt D’Oro (8-1) who was the closest to taking over Justify down the stretch in the Santa Anita, and Audible (8-1) winner of the Florida Derby, the race that has produced the most Kentucky Derby winners in recent years (last two, and 3 of the last 5). Going back even further, 11 of the last 14 Kentucky Derby winners won either the Arkansas, Florida, or Santa Anita. And truth is, if that’s as far as you cared to research this thing, I totally get it. Lots of correlation there to bet on already. But humor me. I’ve got more to say. When I went back and watched all the major prep races, there was one only one moment that truly blew me away. It happened in the Louisiana Derby, a race won by Noble Indy, but it wasn’t the winner who impressed me. It was My Boy Jack. This horse is the ultimate closer, and I admit I’m a sucker for closers. It’s just so much more dramatic, and I think more impressive. This is the first turn, fresh out of the gate. My Boy Jack is the one in the back just doinking around. He practically trots out of the gate. Nothing! See that horse head barely peeking into the frame? That’s our boy. This is entering the final turn. The race is over in another quarter mile and he’s barely in the picture!! …like a ROCKET. Fwoooosh! Out of nowhere it’s like he’s in fast forward. In one turn he goes from entirely out of the picture to almost neck-and-neck with the leaders. How does he have that much gas in the tank?! I could easily be convinced that Jack is the most fit horse in this race. That’s My Boy Jack in the middle of the picture farthest from the rail. A photo finish to show. Just missed it. The rest of the horses are a dozen lengths behind them. If he had just closed that last little length, managed to find a hole to slip through instead of having to bounce way outside, then My Boy Jack likely comes into this weekend as one of the favorites. Instead he’s opening at a 30-1 underdog. But do I think he’ll win? Maybe? A lot would have to break his way, but…maybe? Let’s look at the full gate lineup and see how things look. I liked how I did it last year listing the running-style too, so you’ll see that along with the opening Vegas odds following the position draw Tuesday morning. First, let’s talk about the early pace. Promises Fulfilled and Justify will lead the pack early. Flameaway may be there too, but that name is so dumb it’s hard to think he’ll be relevant. Promises Fulfilled is the fastest sprinter in this race, and with two closers on the inside there’s no reason why he shouldn’t bolt out the gate and establish himself out front. Justify has a little more work to do as does Flameaway, but both should be right there. Promises Fulfilled doesn’t have the stamina to last beyond about the 3/4 mile mark, but Justify will hang around. If Justify is going to win, it’ll have to be wire to wire, and he’s going to have to use a lot of speed early to establish position. All that to say, Justify is in a great spot at #7. The 5-10 range is the most desirable gate position: close enough to shorten the run, but far enough out that you don’t get pinched on the rail. The big question for me when it comes to Justify is whether having Promises Fulfilled to the inside causes him to overdo it early and then fade late if he wears down? He didn’t have much trouble holding off Bolt D’Oro to go the distance in the Santa Anita, but the horses are stronger, the race is longer and the pace is likely faster. We shall see. Audible has a really nice position on the inside nestled in among pacesetters and closers. The #5 spot has produced a ton of winners over the years, including Always Dreaming a year ago. Good Magic is another good horse in the same bunch. The Bluegrass Stakes winner has finished top 3 in all of his races, but let’s not pretend Bluegrass is on par with Florida, Arkansas or Santa Anita. As a stalker, Bolt D’Oro wants to find a comfortable spot in the pack early and slowly creep up as the pace slows down late. I think this setup, with closers on the inside, lets him do exactly that. But he didn’t have the stamina to catch Justify in the Santa Anita, so I don’t expect him to somehow catch him in Kentucky where the race is even longer. Mendelssohn is in a fine spot at #14, I suppose. This horse is like Bowser in Mario Kart – takes some time to work up to speed, but once he does there’s no stopping him. His cruising speed is a huge advantage in a long race. And he was still pulling away. Crazy top speed. The main issue with Mendelssohn is that the UAE Derby hasn’t really translated to success in Kentucky so he’s sort of a wildcard. Could go great, could totally bomb. Shoot, just last year Thunder Snow won the UAE, then went rogue out the gate and didn’t finish in KY. I like this horse a lot and could honestly see him making a joke out of it, but there’s also quite a bit of risk here. Magnum Moon got stuck out in the appendage gate, which isn’t ideal for a horse that likes to be out front. Statistically speaking, if you’re going to be out wide, #16 is where you want to be as it’s resulted in the most wins out there, but with Mendelssohn trying to execute the same gameplan from the other side of the gap, it’s going to be a tough go to break the Curse. The biggest race Magnum Moon has won was a slow pace from start to finish, so he’ll have to run much faster and use a lot more energy to get it done here. That said, if you want to listen to the best race call of the season, watch this starting at the 2:20 mark. Mercy. Really tough draw for Vino Rosso, winner of the Wood Memorial, at #18. While the 17 gate (Solomini) has never had a winner, number 18 has only had 2. American Pharaoh just did it from there in 2015, but he turned out to be a freak. Vino’s just not a strong enough horse to make the longer trek from what I’ve seen. Which brings me to the closers. A quarter of the horses in this race are closers and nearly half like to start slow and let the race develop. I’m a little concerned about that. When My Boy Jack finished so strong the Louisiana Derby, he only had to beat 9 other horses, and 7 of them were pacesetters or pressers. Basically the perfect formula for a closer. Another closer, Lone Sailer was actually the 2nd place horse in that same race, but found a better line. Interesting to note: In the Louisiana Derby, Lone Sailer was #8 and My Boy Jack was #9 just outside him. On Saturday, they’ll be #8 and #10 respectively. We could be in for a similar result. It’s just so much harder to maneuver through 20 horses than it is 10. A long shot, but I won’t be disappointed if I end up with him as a late round pick. Hofburg is worth mentioning here too. He finished second behind Audible and looked strong in the Florida Derby. His positioning on the inner half flanked by a couple closers bodes well for finding space to maneuver early. Beyond that, the rest aren’t worth talking about. I like…Justify, Mendelssohn, Audible, My Boy Jack, Hofburg, Lone Sailor. As always, there’s the chance I’m just making crap up to throw off my family. Reverse psychology. And welcome to the draft, Jeff! My sister’s boyfriend finds himself in the mix this year which we all agree is a very big deal. We’ll honor Jeff’s presence among us by letting him pick dead last. Good luck. Since my son’s name is Jackson, I really doubt 5 different family members pass up the opportunity to pick My Boy Jack, but If they do, the top 5 horses picked will likely be Justify, Mendelssohn, Magnum Moon, Audible and Bolt D’Oro. Maybe Good Magic. Anna will take Bolt because of her love for its endearing jockey, Victor Espinoza, and when someone inevitably takes Jack, that means I’ll have my pick of whomever is left between Justify, Magnum Moon, Audible or Mendelssohn. My get tells me Audible’s still there. Hofburg would be a sweet add with #11, but I doubt he’ll make it back around – slim pickings with an 8 person draft! If he is gone, I’ll probably just spring for Lone Sailor and call it a day. If you can’t get the horse you want, at least pick a closer. That’s my new motto. Check back in at 8:30AM on Saturday to follow the draft. As always, I’ll be updating it live. Dad picks the Florida Derby winner with the top pick. I think this is a great pick. Takes guts to pick against the favorite. Who cares about the Curse? No brainer. Great horse. Great position. My wife gets her son’s namesake. I still think MBJ may win this race, and clearly everyone else does as his odds have moved from 30-1 to 5-1 in 48 hours. A good horse in a nice gate position. He hasn’t really been tested like the other contenders, but not a bad option. Anna gets Victor for the 39th straight year, but this year he’s on a good horse. We all saw this coming. Which means I get Mendelssohn. I was hoping either he or Audible would fall here and he did. After rewatching the UAE I’ve convinced myself Mendelssohn is going to dominate. Quinten’s rolling the dice! Wins once and thinks he can just pick any random horse and it’ll all work out. Kidding – we all know I like this horse. The Curse and gate position causes the top Road to the Derby point receiver to fall all the way to 8th. You’re welcome, Jeff. Okay, but you didn’t have to go and pick the target of my next pick here! The only good horse left. And, as expected, there’s nobody else I really want available here so I’ll take a closer and hope for the best. Same position I was in last year with Looking at Lee last year, so expect some second place fireworks. I also took a Buzzfeed quiz earlier asking “Which Derby Horse Are You?” and I got FDB. Anna’s going to have a really fun opening minute, but this horse could end up finishing dead last. The last 7 Kentucky Derby winners won their final prep race. Horses that fit that description here: Justify, My Boy Jack, Audible, Magnum Moon, Good Magic, Mendelssohn, Vino Rosso…and Noble Indy. Good luck keeping anything in the tank in the end. A bad horse surrounded by pacesetters. Gate 17. Good luck, kapeesh? Better win with Audible, cause…no. A closer on the rail? I could see it. I know nothing about this horse and won’t act like I do here. Late pick closer out of Gate 20! Let’s have some fuuuuun! Currently 99-1. This horse is just happy to be here. Holly wins with Justify! Dad really blew it. Speaking of blew it Mendlessohn finished 73 1/4 lengths behind Justify, which was good enough for dead last. Followed that up with Free Drop Billy (16th) and Combatant (18th), so I’ll be picking first next year. Way to go, Hol! Pressures already on for next year’s first pick. Image source: @BreedersCup on Twitter, accessed at Racing.com. The ALCS is upon us, and judging by the image above, I think we’ve all had way too long to prepare for this series. Personally, I’ve been prepared since Sunday night. I refused to leave the Kauffman Stadium parking lot following our sweep of the Angels. The crowd erupted and so did the sky as it poured down rain and flashed lightning. It was like the whole universe was celebrating with us in the parking lot. There was no where to go (not that the traffic would’ve allowed it anyway) because there was no where else anyone would rather be. At one point, in my raucous celebrating, I high fived a stranger and we accidentally hit elbows before we hit hands. I owe some poor guy out there an apology: Sir, if your forearm aches as badly as mine has over the last four days, I’m truly sorry. Although, gotta ask yourself, was it worth it? We’ve gone four days now without Royals baseball, and the coverage both locally and nationally has been exhaustive. The national media has latched on to the Royals’ speed and how the Orioles are going to keep them from running wild. They’ve compared our lineups, our bullpens, our starters and our benches. They’ve started discussing whether the Royals will make a run at resigning James Shields for 2015 and beyond. They’ve also finally noticed that Lorenzo Cain exists, which is a little disappointing to me because I loved him first. Sigh. This is probably how people who listen to Alt Nation on SiriusXM feel about music all the time. Also, Lorenzo: congrats on Baby Cameron. I don’t even care that you gave him a nod-to-self middle name in “Loe.” I hope he and Nash Holland grow up to be best buds someday. So how about some not-really-grounded-on-anything ALCS predictions that are probably a little bit wacky, but that could happen nonetheless, to get us revved up for Game 1 tonight in Baltimore? Some are wackier than others. Here we go. Prediction 1: Steve Pearce has a miserable series at the plate for the O’s. First of all, who is this guy? Pearce has gone from a nobody to arguably the Orioles MVP in 2014. Before this year, Pearce had never posted a WAR higher than 0.5 in his 7 year career. In fact, in three of those years he posted a negative WAR. This year? He leads the team with a 6.0 WAR. Which is just goofy, because again, who is this guy? And it’s fair that we don’t know who he is in KC because the Royals have never faced him this year. He played in 102 games, and none of them were against Kansas City. Lifetime against the Royals pitching staff: 6 plate appearances against Vargas (1-5, 1B, BB), 0-1 vs Wade Davis and 0-1 vs Jason Frasor. Frasor is the only one who faced him this year and that was back on July 1 when Frasor was with the Rangers. From what I can tell, Pearce waits for his pitch, and if he doesn’t get it he either walks or strikes out. He likes the ball up in the zone. So as long as we can keep the ball down and get ahead in the count, Pearce is going to have a long series. Prediction 2: Adam Jones homers off of Kelvin Herrera tonight. Seems preposterous to think that anyone from the Royals bullpen would give up a home run at this point. They’ve been locked in all year. But here’s how I think it will go down. Jones has great numbers against Shields: .304/.319/.522. He’s seen him a lot too since they used to be AL East rivals when James was with the Rays. My prediction: Ned Yost pulls Shields in the 7th and brings in Herrera to pitch the righty Jones. It’s the right move too: Jones is 1-6 with 2 Ks against Herrera and the 7th belongs to him anyway. But Yost has to get yelled at for something, and this will be it. Hope I’m wrong. Prediction 3: Eric Hosmer comes back to Earth while Alex Gordon leaves it. Hosmer can’t sustain this kind of postseason success at the plate. Just no way. Alex Gordon got a giddy up off his huge triple in Game 3 of the Division Series. I’m predicting Hosmer regresses significantly while Gordon blasts off. Just feels right. They both have terrific numbers against the entire pitching staff. Especially Wei-Yin Chen. This isn’t based on anything at all. Just a hunch. Feels like Gordon’s time. Prediction 4: Christian Colon plays the hero at some point this series. I’m not high on Omar Infante. He feels like a peripheral character on this team. While everyone else is having the time of their lives, Infante seems to just be…around. He has a weak arm at second base and will probably need shoulder surgery in the offseason. Mike Moustakas, while swinging a hot bat, is slower than everyone not named Billy Butler. His defense is solid, his arm is good, but when we need speed on the bases late in a game, I don’t want him representing the tying run on first or second base. Enter Christian Colon as a defensive, offensive or speed replacement. If a game goes long – which Royals postseason games tend to do, apparently – then Colon will end up taking one of those two spots in the field. He gives this team flexibility in all aspects of the game. I think he’ll find his way up to the plate or on the base paths in a key situation late in a game. Again, just feels right. Prediction 5: Kansas City wins the ALCS in 5 games. 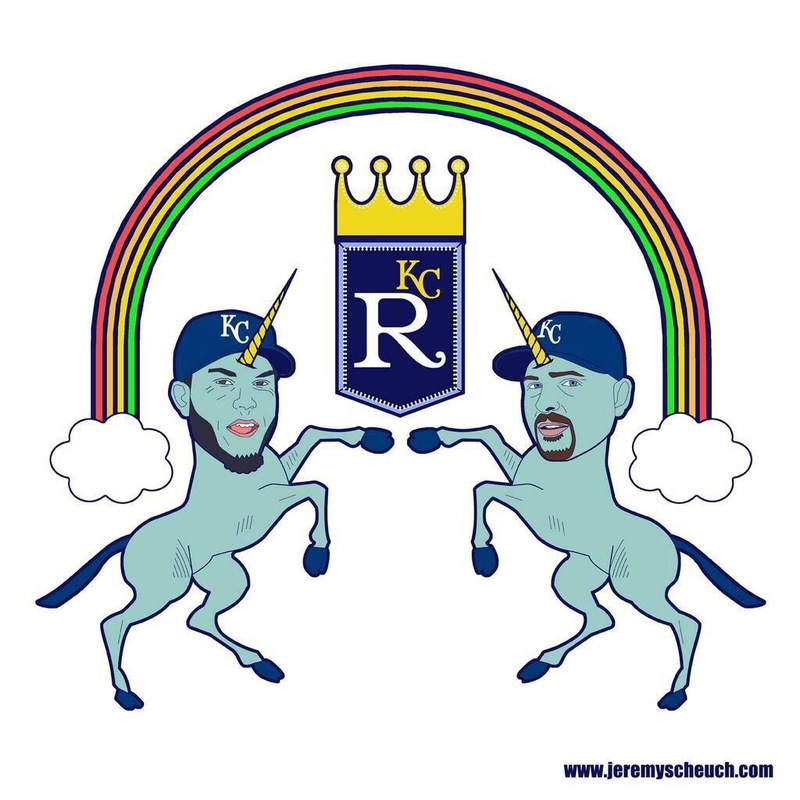 I trust James Shields and Yordano Ventura on the road. I trust Jason Vargas and Jeremy Guthrie at home. And I obviously trust Shields at home too in Game 5. Chris Tillman and Bud Norris are both quality pitchers who already have good starts this postseason. Chen is fine, but gave up 5 runs on 7 hits in 3.2 innings in his start last week. This game is going to get to Game 5 with the Royals up 3-1. Big Game James takes us the rest of the way and our boys get to celebrate in front of their own fans again on Wednesday. What’s the word on champagne sales in Kansas City these days? Has to be through the roof, right? I should note: that glorious image at the top popped up on my twitter feed this morning here. Jeremy, hope you don’t mind I borrowed your pic. Also, if that image is any indication of your character, let’s be friends, okay? Opening Day is just five days away, and I figure now is probably the perfect time to go ahead and make my preseason predictions for the 2014 MLB season. I’ll look at each division for the regular season, and include who I think will take the Wild Card spots, but I’m not going to make any postseason/World Series predictions here. I’ll reserve that for later. So here we go. This is how I think the MLB will shake out in 2014. Postseason teams are in italics. The Red Sox starting pitching is still dominant, but they lost major pieces from last year’s championship team. The Rays resigned David Price and added closer Grant Balfour to their pen. They are young, and are the safest bet of any of the teams from the East. Yankees, as usual, spent insane money (Tanaka, Beltran, Ellsbury), but money spent doesn’t guarantee wins. And as poetic as it would be for Jeter to go out on top, it’s just not going to happen. Distractions galore = missed playoffs. The Orioles offense can only take them so far, and Ubaldo Jimenez doesn’t really solve their poor pitching in my opinion. As usual, this division will be a fight to the end, but I think the Rays come out on top and the Sox take a Wild Card Spot. The Tigers rotation is arguably the best in the majors with the 5 starters projected to combine for 19.5 WAR according to ZiPS. Miguel Cabrera is one of the top two players in baseball (along with Mike Trout). Assuming they don’t have any more serious injuries beyond Jose Iglesias, they should be able to take the AL Central again in 2014. The Royals, however, will run away with 2nd place, and I think this is the year they end their postseason draught by snatching up the other Wild Card spot (Eeeeeek!! I have such high hopes, I know.) The Indians won’t match their 30 wins in 1-run games from last year and are bound to regress. Twins will improve. White Sox are the worst. The Nationals, if healthy, are going to be nasty in 2014. What’s interesting is that I wouldn’t be picking them #1 if the Braves hadn’t just lost Kris Medlen and Brandon Beachy for the season. And even though they panicked and picked up Ervin Santana, he’s not enough to make up for the damages. The Braves locked up their entire young core of players to long term deals and they’ll be very good for a long time, but without their ace, Medlen, and Beachy, they’ll finish behind the bounce-back Nationals in 2014. Marlins, by the way, are going to be much improved this year I think. The Cardinals are the best overall team in baseball. They have no holes. They have the bench depth they lacked in the playoffs last year. The Wacha/Wainwright combo will be deadly and as long as Yadier Molina is behind the plate, they’re the favorites in this division. The Reds and Pirates are both playoff contenders, and it wouldn’t shock me if they both ended up with Wild Card spots like last year (but I think the Giants will take one of them away). I’m hoping Aroldis Chapman makes it back soon because the Reds need him closing very very badly. It’ll be another “maybe next year” season for the Cubbies, but they’ll start climbing the standings over the next couple seasons. Simply put, when Kershaw and Grienke start a third of your games, you’re going to win your division. Throw in a stacked lineup and a chip on their shoulder after missing out on the World Series last year, and I think they’re primed to win this division big. Plus they’re already 2-0 after that Australia fiasco. However, the Giants have been sleeping on basically the same roster as their 2012 championship team. With Buster Posey back, a 40 lb lighter Pablo Sandoval, and a short-haired Tim Lincecum, they’ll get back to winning in 2014. But this division is the Dodgers to lose. And, as always, I’ll be rooting hard for a 1985 rematch.